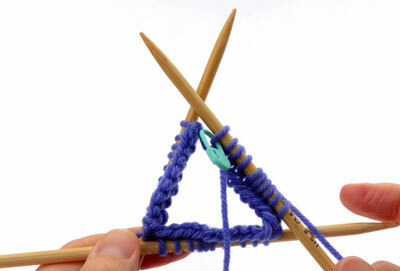 The oldest method of knitting in the round involves using double-pointed needles (dpns). After you cast on the desired number of stitches for your project on the appropriate-length circular needle, you follow these steps to start knitting. 1Slide the stitches along the cable so that they are evenly distributed along the entire length. Be careful not to let them slip off either end of the needle. 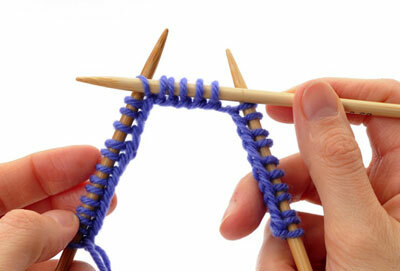 2Starting with the first cast-on stitch, move about one-third of the stitches onto an empty double-pointed needle. 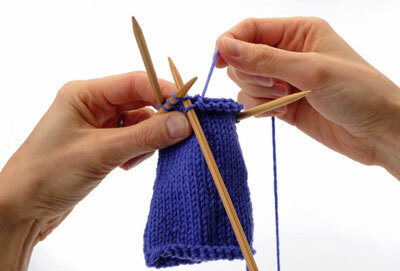 When arranging stitches on the needles, be sure to slip the stitches as if to purl. 3Slip the center third of stitches onto another empty needle. This is needle 2. Needle 3 retains the last third of the stitches. One empty needle (needle 4) remains. 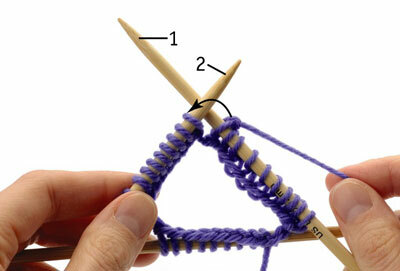 For a set of double-pointed needles, you distribute the cast-on stitches among three of the needles. 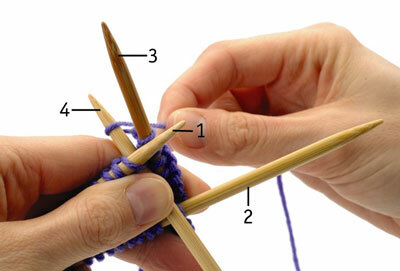 For a set of five, you distribute the stitches among four needles. You use the remaining needle to work the first set of stitches. 4Place the work down on a table in front of you and take a look. The yarn tail and working yarn should be on your left. Needle 1 should be on your right. 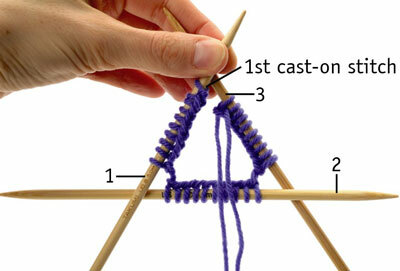 Adjust your cast-on edge so that it is not twisted around the needles. Make sure that the bottom edge of the cast-on runs smoothly from needle to needle without looping over the needles. 5Flip the work over so that needle 3 (with the yarn tail and working yarn) is on the right, and needle 1 (with the first cast-on stitch) is on the left. Bring the free ends of needles 1 and 3 together to form a triangle. Lift the work in your left hand with needle 1 on top of needle 3. This may feel fiddly at first, but you will get used to it. 6Position the working yarn so that it runs up from the last cast-on stitch to the outside of this triangle. 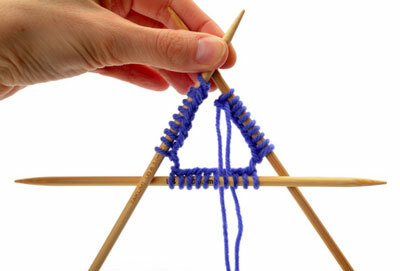 The working yarn should not pass through the center of the triangle. 7Begin to work in the round by inserting the tip of the empty needle (needle 4) into the first cast-on stitch on needle 1. Knit this stitch. Be sure to pull this first stitch tightly, as it will join your work. 8Continue knitting across needle 1. When you have knit all of the stitches on this needle, rotate your work and begin knitting the stitches of needle 2 using the newly emptied needle. 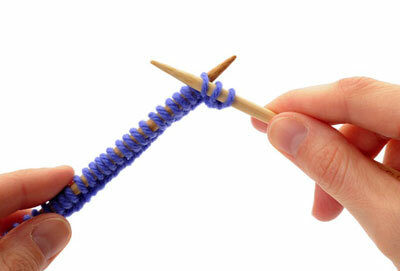 Be sure to maintain a firm tension when knitting the first stitch on each needle. This helps to prevent laddering . 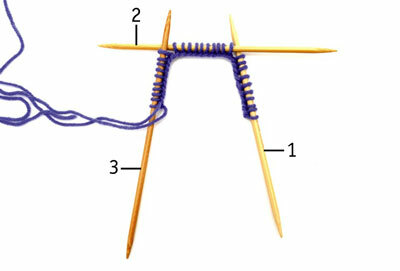 9When you reach the end of needle 2, rotate your work again and use the empty needle to knit the stitches on needle 3. When you reach the end of needle 3, you have knit one complete round. Note the presence of your yarn tail, which indicates where your new round begins. Because it gets harder to see the tail as you knit more rounds, you can use a stitch marker to indicate the end of your round. You can insert a locking or split-ring marker directly into the last stitch of the round and move it up every 20 rounds or so as needed. If you wish to use a solid-ring marker, place it before the last stitch of the round to keep it from falling off. 10Continue to knit in a spiraling path around your work. 11When your project has reached the desired length, bind off. 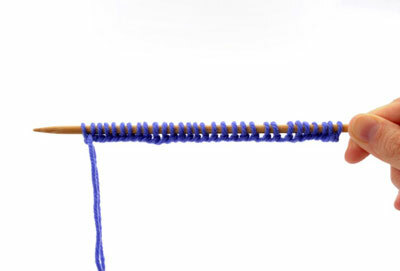 Some knitters find working with double-pointed needles more difficult than other circular knitting techniques because of the number of needles involved. If you find starting with this method frustrating, try knitting back and forth on two needles for about 1 inch, and then divide the stitches onto multiple needles and join for working in the round. Continue working until you are comfortable, then rip the work out and begin again, this time joining the work immediately after the cast on.